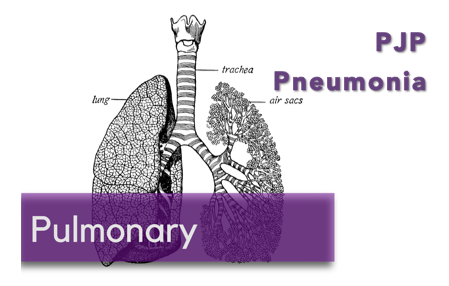 Pneumocystis pneumonia (PCP) is one of the most common AIDS-defining opportunistic infections. It is a fungal disease that affects patients with an impaired immunity. Though it is most commonly associated with HIV and AIDS, the advent of HAART has been associated with a decreasing prevalence of PCP within the HIV population. While the prevalence has been decreasing in the HIV population, it has been increasing in patients receiving immunosuppressive therapy. PCP in the non-HIV patient is becoming an important diagnosis but is less recognized in its early stages. PCP is now mostly diagnosed in the non-HIV population and is associated with higher mortality rates. When comparing PCP in the non-HIV versus HIV population at a single center, over nine years the ratio of non-HIV to HIV PCP patients increased from 1.7 to 5.6 and mortality at day fourteen was 25.9% v 1.4%, respectively. Part of the explanation for the high mortality is that the non-HIV population frequently presents with less symptoms and diagnosis via microscopic examination, which is quicker, more often produces a false-negative compared to real-time polymerase-chain reaction (PCR). By lack of early recognition of PCP in the non-HIV patient and delay in diagnosis, there is a lag in treatment initiation which contributes to the higher mortality rate of the non-HIV patients with PCP. Bactrim is the mainstay of treatment for both non-HIV and HIV PCP. In the non-HIV population, Bactrim has been shown to be highly effective and reduces PCP-related mortality by 83%. The prophylactic dose is 80-160mg daily while the treatment dose is 15-20mg/kg/day (both dosed based on the trimethoprim component) divided every six to eight hours for twenty-one days. Adverse reactions are commonly seen in HIV patients and can range from rash, fever, leukopenia, thrombocytopenia, azotemia, hepatitis, and hyperkalemia. Given the efficacy of bactrim compared to alternative regimens, it is suggested that supportive care be initiated prior to initiating alternative regimens which are listed below. When should steroids be utilized? Steroids should be given for moderate to severe disease. Moderate to severe disease is defined as PO2 <70mmHg or A-a gradient >35mmHg on room air. The steroids are dosed on a twenty-one day prednisone taper, starting at 40mg PO twice a day. PO regimens taper from 40 mg BID for 5 days to 40 mg daily for 5 days to 20 mg daily for 11 days. If the patient is unable to tolerate PO, IV methyprednisolone can be given at seventy-five percent of the prednisone dose. When considering steroids, early initiation is important and an ABG should be obtained in the emergency department. Clinical failure is defined as lack of improvement or worsening respiratory function after four to eight days of PCP treatment. In patients with mild to moderate disease, this occurs in about ten percent of cases. It should be noted that in the absence of corticosteroids administration, clinical deterioration is not uncommon. ED providers must also consider co-infection with additional microbes, while the inpatient team may discuss bronchoscopy. Depending on disease severity, options for alternative therapies include atovaquone, clinidamycin, and primaquine, however these decisions should be held in conjunction with the patient’s primary physician and/or infectious disease doctor. Pneumocystis jerovecii pneumonia (PJP) is a life threatening and severe infection that traditionally affected individuals with AIDS. As described in the blog piece the epidemiology of affected patient populations has changed over the past 20 years with effective HIV therapy. It is currently more common to see PJP in persons that have had an organ transplant, stem cell transplant, those on glucocorticoid therapy and those receiving therapies that deplete their T-lymphocytes. A major risk factor for the development of PJP is the use of glucocorticoid medications. On average the median dose of steroids associated with the development of PJP is 30mg/day. At Northwestern Medicine we recently published on our experience with PJP in the Solid Organ Transplant recipient population. We found 15 cases of PJP over a 15 year period. Among these 15 patients, six required intensive care unit management and three (20%) died from there infection. Low absolute lymphocyte count, especially <500 cells/mm3, had the strongest association with development of PJP. This data demonstrates that the key immune cells that help defend against the development of PJP are the lymphocyte and in particular the CD4+ T-lymphocyte. The presentation of PJP in non-HIV infected individuals is similar to that in HIV-infected with fever, dry cough and progressive dyspnea, but many non-HIV infected individuals may present with fulminant respiratory failure. Fortunately trimethoprim-sulfamethoxazole remains the treatment of choice for this infection, with adjunctive steroids used for those with severe respiratory compromise. For the emergency room provider PJP should be on the list of potential causes of pneumonia or respiratory compromise not just in HIV-infected persons, but in those with compromised immune systems. Like all infections early recognition and early treatment result in better patient outcomes. Yale SH, Limper AH. Pneumocystis carinii pneumonia in patients without acquired immunodeficiency syndrome: associated illness and prior corticosteroid therapy. Mayo Clin Proc. 1996;71(1):5. Bienvenu, Anne-Lise, et al. “Pneumocystis Pneumonia Suspected Cases in 604 Non-HIV and HIV Patients.” International Journal of Infectious Diseases, vol. 46, 2016, pp. 11–17., doi:10.1016/j.ijid.2016.03.018. “DPDx - Pneumocystis.” Centers for Disease Control and Prevention, Centers for Disease Control and Prevention, 30 Dec. 2017, www.cdc.gov/dpdx/pneumocystis/index.html. “Fungal Diseases.” Centers for Disease Control and Prevention, Centers for Disease Control and Prevention, 26 Apr. 2017, www.cdc.gov/fungal/diseases/pneumocystis-pneumonia/index.html. Liu, Yao, et al. “Risk Factors for Mortality from Pneumocystis Carinii Pneumonia (PCP) in Non-HIV Patients: a Meta-Analysis.” Oncotarget, Vol. 8, No. 35, Apr. 2017, doi:10.18632/oncotarget.19927. “PCP Adult and Adolescent Opportunistic Infection.” National Institutes of Health, U.S. Department of Health and Human Services, 25 July 2017, aidsinfo.nih.gov/guidelines/html/4/adult-and-adolescent-opportunistic-infection/321/pcp. Rosen, Peter, et al. “HIV Infection and AIDS.” Rosen's Emergency Medicine: Concepts and Clinical Practice, Elsevier, 2018. Stern, Anat, et al. “Prophylaxis for Pneumocystis Pneumonia (PCP) in Non-HIV Immunocompromised Patients.” Cochrane Database of Systematic Reviews, Jan. 2014, doi:10.1002/14651858.cd005590.pub3. Posted on January 14, 2019 by NUEM Blog and filed under Pulmonary and tagged PCP pneumonia HIV.